How can you order your copy? Order your copy by sending an email to info@brusselschamberchoir.be. 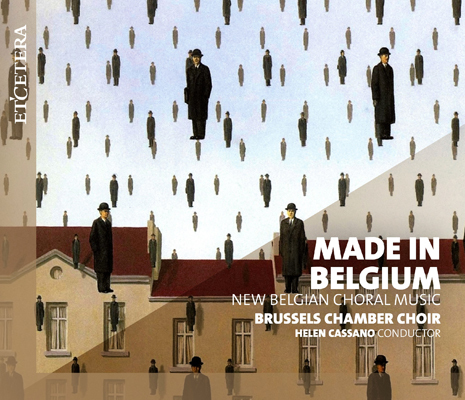 To mark its 10th anniversary, the Brussels Chamber Choir has recorded its first professional album: “MADE IN BELGIUM: New Belgian Choral Music”. The album presents a selection of beautiful choral works written throughout Belgium between 1985 and 2017, and introduces several works in world première. The Brussels Chamber Choir and conductor Helen Cassano hope to spark your curiosity with a varied range of sacred and secular works by composers from Flanders, Wallonie and Brussels. Far from showing a unified, national style in choral writing, the works on this CD all share a strong international flavour, and the composers share some of the same influences and sources of inspiration: Flemish composers Maarten Van Ingelgem and Piet Swerts both present works inspired by the First World War; Brussels organists Xavier Deprez and Luc Dupuis, as well as Flemish organist Rudi Tas and Stephan Laschet, native to the German-speaking region of Belgium, write religious works inspired by medieval chanting and organ music; Kurt Bikkembergs and Roland Coryn propose two heart-breaking settings of William Blake poems; Walloon composer Guy-Philippe Luypaerts sets a comic French poem; Brussels composer Jean-Marie Rens harmonises a Dutch-French bilingual 16th-century love song. Three composers who sing or have sung in the BCC have composed works especially for this album: British composer Toby Wardman presents an arrangement of a well-loved Walloon folk-song, Jan Moeyaert sets a Dutch Sympolist poem and Alan Charlton sets a Belgian Symbolist poem for choir, vibraphone and recorder. I welcome the recently released “Made in Belgium” CD by Helen Cassano and the Brussels Chamber, a portrait of contemporary polyphony our country’s three regions, bridging the traditional divides which all too often blinker our vision as artists, musicians, citizens and, ultimately, as human beings. By one of those quirks of Belgian humour, we have an expat to thank for this: Helen Cassano was born in London and lived in Madrid before coming to Belgium. From very first track, the listener is struck by the BCC’s vocal quality and consummate musicality, both in the colour and blend of its voice parts and in their overall balance. The rounded phrasing and refined dynamics suggest a demanding level of choral preparation. The chosen repertoire ranges from sacred music to Flemish and Walloon folk songs, and includes compositions on texts by Belgian, French, British, Irish and Dutch poets. Whilst the aesthetic quality of the sacred pieces is at times reminiscent of Flemish Primitive painting, with its attention to detail and its world vision bordering on the mystical, the rest of the repertoire displays an eclectic array of musical influences: Gregorian plainchant, modal harmonies, impressionism, suspended dissonances. From the very first track, the listener is struck by the BCC’s vocal quality and consummate musicality, both in the colour and blend of its voice parts and in their overall balance. An interesting feature of the collection is that all the composers, apart from Guy-Philippe Luypaerts (who died in 1999), are currently active on the Belgian and international musical stage, not only as composers, but also as singers, instrumentalists, teachers and conductors. Alongside well-known personalities, the album also showcases promising young talent: it seems that choral polyphony, with roots stretching far back through the centuries, remains a vibrant means of expression to this day. The recording leaves one with the same overall impression as when beholding a fine sculpture, or relishing the subtle interplay of half-tones and chiaroscuro of a canvas. The fifteen tracks on the album are ordered in what may at first seem a rather stark juxtaposition, but this obliges the listener to pause and listen to each piece in isolation, thus appreciating its specific beauty. This commendable initiative seeks to reconnect with the Golden Age of Franco-Flemish polyphony, echoing the life of Orlando Lassus, that bulwark of the Renaissance with roots in his native Mons and a truly international stature, a composer whose mysticism went hand in hand with a strong sense of humour, and whose ecstasy was both spiritual and carnal. This new recording offers a vivid snapshot of the polyphonic scene in modern-day Belgium, both through its choice of pieces and the manner in which they are performed, and I very much hope it will pave the way for other similar ventures. Read the article in French or Dutch. This recording was made possible by generous financial contributions from over 150 crowd-funders from all over the world, to whom the Brussels Chamber Choir is extremely grateful. A special mention goes to our main sponsors Alan Charlton & Nicola Robinson, Elien Cardon, Paul Gosme, Thierry Stulemeijer, Fam. Marien-Segers, Fam. Fobelets-Blaude, Pawel Nalewajko, Timothy Sullivan & Karen Ericksen, János Herman & Zsuzsanna Hermanné Mata, and J.H., as well as to other major benefactors who requested to remain anonymous.